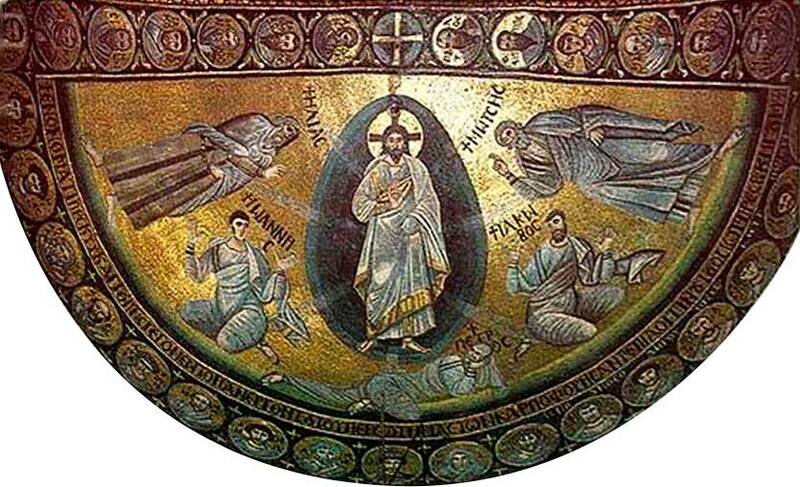 Mosaic from the ceiling of St. Catherine's Monastery, Sinai Peninsula, Egypt, depicting the Transfiguration of Christ. This is the oldest (or one of the oldest) working monasteries in existence, originally dating from the 6th century. The figures on the mosaic represent, counterclockwise from the top left, Elijah, John, Peter, James, and Moses. Dear God, There is only one voice that is perfect truth, and that is yours: the voice of your Spirit and the voice of your Word. Help me, I pray, to hear your voice clearly. For I tend to lose it in the cacophony. I am filled with the sound of my own voice, with the sense my importance and the correctness of my thought; and on top of that, I am besieged by dozens and hundreds and thousands of words and voices telling me all kinds of things. Men are like wine — some turn to vinegar, but the best improve with age. e see Jesus, time and time again, charge those who witnessed miracles or teachings not to tell anyone about it. He does not give a reason for this, but one obvious explanation is that He does not want the Jewish people to widely proclaim the coming of the Messiah before they (or at least some of them) understand what the Messiah is. Jesus is very different from what they expect. Most Jews expect a beefed-up version of David, a military and political leader, probably of high birth, who would drive the Romans from the Promised Land and reinstitute the integrated Kingdom of Israel. fnMost Sadducees thought the Messiah had actually already come! They saw the Messiah not as a man, but as a process, that had started with Judas Maccabeus. We have seen, and continue to see today, how difficult it is for people to hear the actual message of Christ. People will say and do all kinds of crazy and unchristian things in his name. Even with Peter beginning to comprehend the full meaning of his existence, Christ anticipated the difficulties the church would face, once He had ascended. God would not force salvation on us. But if a Christ Movement arose as an armed rebellion, not only would Christ's message of a new covenant (and therefore the salvation he brought) be drowned out, but any Christian who understood the message would be slaughtered along with the rest of the “rebels”. As it was, Christ intervened directly by converting Paul; but that was as far as God intended to go, in using force to spread repentance and the acceptance of the Holy Spirit. The idea that Elijah would reappear in advance of the Messiah is complex. It was a doctrine widely held among the Jews. John the Baptist did act as a forerunner of Christ, and here Jesus speaks of John as fulfilling the expected role of Elijah; but John the Baptist, himself, denied he was Elijah. (John 1:21) And indeed, he was not, for Elijah was a specific individual and had not died. So essentially, Christ is saying, if you would have Elijah before the Messiah, you have John. But God also gives Peter an ironclad fallback; he and two other Jews have personally witnessed Elijah's return. Yes, the entire business of John and Elijah (and the multiple prophecies of Malachi) is complicated to us. But the Transfiguration actually simplified the acceptance of Christ, and the proof of his divinity, for Peter and the apostles. If there were any confusion about the return of Elijah — he had returned and they had seen him! Russian Orthodox icon, ca. 1550, of Elijah’s fiery chariot taking him to heaven.